What does “Geofencing” mean and how will it protect your vehicle or valuable asset? “Geofencing” for GPS tracking devices relates to a location area created around a particular object – in this case, your vehicle (or asset). It’s not a physical fence, of course, but an electronic one. When your vehicle moves out of this area a message is sent to your mobile phone (and emailed to you, if programmed). Whether you have left your vehicle in long-term parking or on the street you will be able to monitor the safety of your vehicle while you are away. It’s easy to set and enable your geofence function with the fleetminder mobile phone app for fleetminder GPS tracking devices. Click on the “GEOFENCE COMMANDS” button on the fleetminder app and press the relevant orange buttons. The “SET HOME GEOFENCE” button will send a command to your fleetminder GPS tracker. This will program your home location (typically your garage or where you park your vehicle at night). This only needs to be done once as usually your home address will remain the same. Then you simply press “GEOFENCE ON” or “GEOFENCE OFF” to enable or disable the geofence notifications. When you are out it’s also very easy to set goefence notifications using the fleetminder GPS tracking app. The “SET CURRENT GEOFENCE” button will send a command to your fleetminder GPS tracker. This will program the vehicle’s location where you have parked it into the GPS tracker. If you wish to use this function again (in a different location), you will need to press the “SET CURRENT GEOFENCE” button again. By using the geofencing function capabilities with your fleetminder GPS tracker you will be informed if your vehicle or asset has been moved or towed away. Whether that’s by a family member, the local council, a thief or by someone else (such as an employee, contractor, etc). 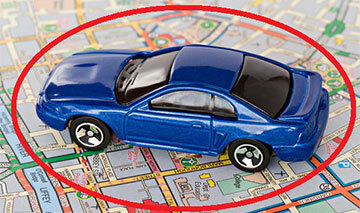 This will allow you to take action to track the vehicle (or asset) and recover it quickly.